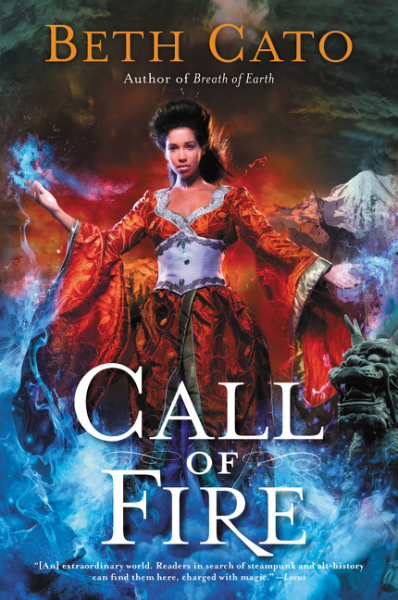 The Page 69 Test: "Call of Fire"
Nebula-nominated Beth Cato is the author of the Clockwork Dagger duology and the Blood of Earth Trilogy from Harper Voyager. Her newest novel is Call of Fire. She’s a Hanford, California native transplanted to the Arizona desert, where she lives with her husband, son, and requisite cat. “Papa? Papa!” A girl’s voice screeched from above. By the time Ingrid glanced up, all she spied was a blur of movement. Feet pounded down the stairs. The girl leaped to a stop before them. She was young with creamy brown skin, a stick figure in calico and stained white stockings. A mismatched bow in kimono fabric was almost bigger than her head. Ingrid didn’t know what to think. This latter half of page 69 is at the very end of a chapter, and in the few lines that follow, Ingrid is about to get quite a shock about the identities of these two strangers. My Blood of Earth trilogy features an alternate history of 1906, with the United States and Japan allied as a world power. Japanese influences, therefore, are quite evident in everyday America, from food to speech to clothes. Even in these few lines, there's mention of scrap kimono fabric being used as a bow. Worldbuilding often comes in small dribbles of details like this.